Although the differences between a residential proxy and a backconnect proxy are very few and subtle they do make a major difference when it comes to proper usage and efficiency. Most of us confuse the two of them and tend to consider them as equals but in reality, they do differ considerably. In this article, we shall to try to explain briefly those subtle differences and hence eliminate any misunderstanding regarding the two proxies. 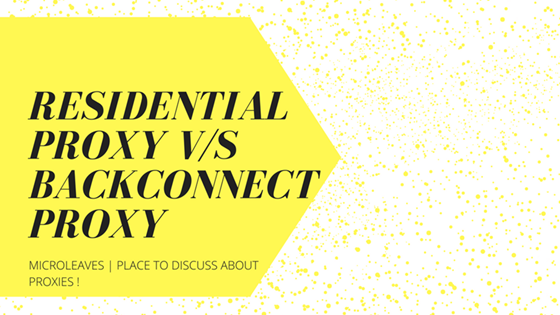 Before we move on to the differences between a backconnect proxy and a residential proxy let us first understanding the present day scenario regarding proxy usage and the everyday problem the user has to face. In case you do use a lot of proxies you must know that you will be required to perform tons of search queries at a time in order to harvest data from a host of different websites. Now suppose you have moved on to the next app and are performing a huge amount of web crawling for it. Now, you are bound to come across a lot of blocks and unless you know the way to slip away from them your app will not be as effective as desired. Here is where you need to learn the little differences between a backconnect proxy and a residential proxy because you surely do not want to see your proxies getting banned while they keep working as a slave for you, harvesting a lot of data at the cost of their lives. Suppose your proxies get banned then your data collection will be rendered incomplete. Then you will be forced to install new proxies so that the harvesting of data gets completed and that will take away a lot of precious time from your clock which will affect the efficiency of your system. The above scenario is a very commonplace scenario that occurs time and again to multiple users. The first step to ensure that this does not happen with you is to learn the system through which websites detect proxy IPs. Lots of queries getting sent from a single server. Queries which are identical coming in at bulk. If the queries, large in number, come from a location that the websites deem irrelevant. If the query use terms that are of high risk or red flagged. Let us formulate a bit of understanding about backconnect proxies before we delve deep into the comparisons. Essentially a backconnect proxy and a standard proxy are very similar in terms of its working procedure, its advantages and disadvantages. The only major difference lies in the server being used for each of them. Contrary to normal proxies, a backconnect proxy uses multiple configurations linked together via different machines instead of being composed of a solo machine doing all the work. Why do you need a backconnect proxy? Well, it enables you to change your IP address and referrer data, similar to a standard proxy but in a different way. The main benefit that can be derived of a backconnect proxy is the sheer number of requests that can be per minute by using it. By using a backconnect proxy all your connections will be sent via a different IP address and the website will also be accessed from a different point of connection. The only major drawback about backconnect proxies is the associated cost and the oscillating quality of proxies that are provided. How it differs from residential proxies? The differences which are few yet significant can be explained better if you first understand the way a residential proxy work. The main feature of a residential proxy is the higher level of anonymity it provides while filtering data for you. They primarily are devised to play the role of a middleman. In case you are using a proxy your connection will leave your computer and shall travel via the great links and networks of routers and then reach the proxy. Having reached there it then move the connection forward to the server using standard protocols of web requests such as HTTP or SOCKS. As soon as the web server responds to your request the data will be sent back to the according proxy. There are a lot of ways to configure a residential proxy and use it for the transmission of data without any alteration. The added amount of security and anonymity are the reasons of a residential proxy being so popular. When it comes to backconnect proxies, they tend to be even more secure than a standard residential proxy as they have the ability to alter your IP address more frequently. A backconnect proxy is mostly equipped with a rotation feature with a fixed rotation interval which can be 3 minutes or 10 minutes as per requirement. This rotation feature goes a long way in ensuring that all your requests to a particular website is being sent from a different IP address which is not I the blacklist. Much similar to a residential proxy a backconnect proxy also changes the IP address and data of the referrer but some backconnect proxies also has the accessibility to a host of other residential proxies. This enables you to practically leave no trace of any scraping in the websites and hence be relieved of any concerns about your IP address getting blocked. The basic difference between a backconnect proxy and a residential one is stark. While the former connects you to a host of IP addresses, the latter has the ability to represent residential IPs that are static and which you can only use to get your requests passed through. You can judge them on the basis of your requirements. If your requirement concerns only browsing the web then you can safely go with residential proxies. Any advanced projects such as creating accounts, web crawling or SEO software usage demands that you use a backconnect proxy so that you can perform unperturbed.